Today’s Fabulous Friday the 13th answer comes from one of Alethea’s favorite authors and gamer grrls: Monica Valentinelli. The one thing I feel I can’t write without is my noise-cancelling headphones. When I wear them, my world suddenly shrinks and I feel more focused on what is in front of me. It doesn’t matter if I’m furiously typing on a keyboard or scribbling in a notebook, either. Being able to control peripheral noise has been one of the best things that ever happened to me. Monica Valentinelli is a writer, editor, and game developer who lurks in the dark. 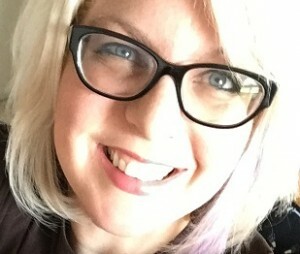 She writes both original and media tie-in fiction and works on games and comics, too. To date, she has over six dozen creative credits with more on the way. She is known for her work as the lead writer and developer for the award-winning line of Firefly RPG releases based on the TV show by Joss Whedon. Recently, she announced The Gorramn Shiniest Language Guide and Dictionary in the ‘Verse will be available in Spring 2016 from Titan Publishing. Or fun gossip. 🙂 Thanks for sharing! I’m telling you, I am so honored at all our fabulous guests this month who are sharing these really cool little tips about their writing/working world, and you, Monica, are no exception! Thank you so much for stopping by and telling us your secret. I have a song to dedicate to you … “Enjoy the Silence” by Depeche Mode. Fishy kisses!